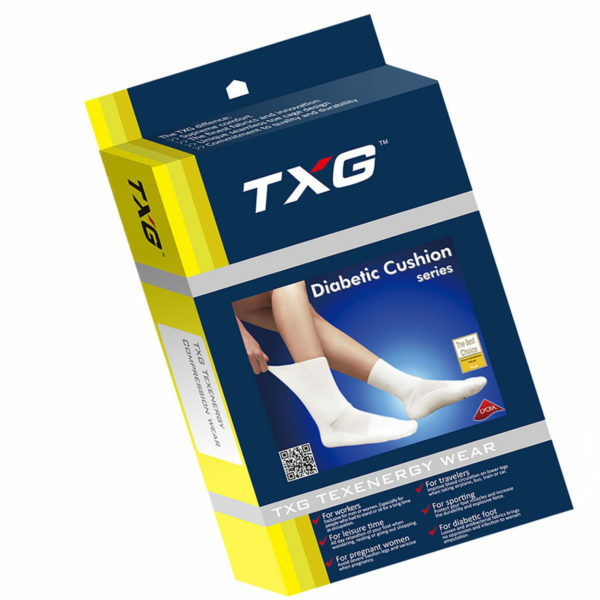 TXG Cushioned Socks for Diabetics are designed with the unique needs of people with diabetes in mind. Whether you’re managing your diabetes or need help after injury or surgery, our socks will ease your discomfort by providing compression free cushioning that’s so soft and comfortable you’ll feel like you have Guardian Angels on your feet. Our socks combine lycra, acrylic fibres and nylon to create an antibacterial sock that keeps odour causing bacteria from thriving. They are non-allergenic, so they won’t cause irritation or trigger allergic reactions, keeping your feet comfortable no matter how long the socks have been on your feet. We’ve integrated a non-binding top band that expands to eliminate pressure points and have ensured that each sock is sewn using hand linking to prevent raised seams from causing irritation. 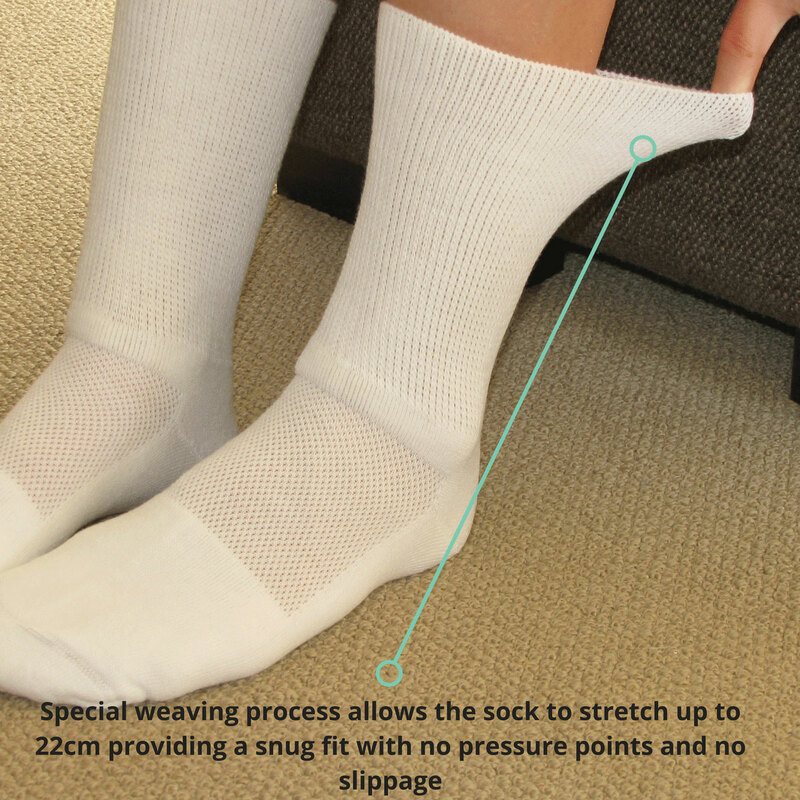 Finally, thanks to our unique weaving process our socks can stretch up to 22cm more than their original length, to ensure you have a snug fit with no pressure points and slippage. 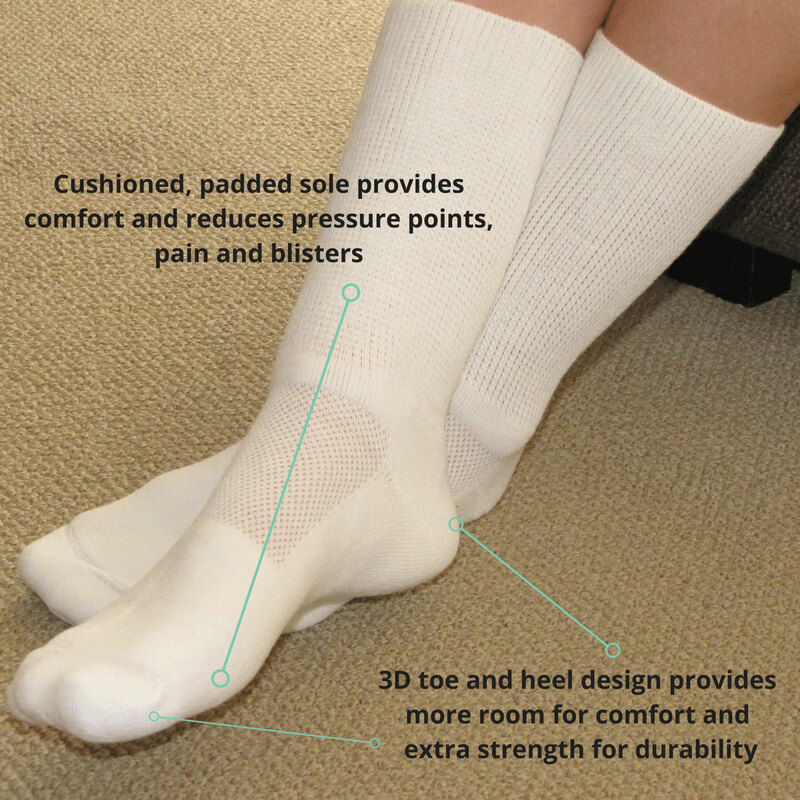 Ready to experience the benefits of TXG Cushioned Socks for Diabetics, starting today? These warm diabetic socks (Guardian Angels of your feet) are perfect for you if you’re looking for comfortable, warm diabetic socks that will help keep your feet warm and protect them from injury. Simply choose your size and add to cart at the top of the page to have your socks delivered to you anywhere in New Zealand with our free 7-day standard delivery, or you can upgrade to Express 2 to 3-day delivery for just $5.99. Rural deliveries take an additional 2 to 3 working days. What excellent friendly communication, superfast delivery, very well packaged, great product with plenty of instructions. Socks feel so comfortable on. Thanks so much. I have type 2 Diabetes and these socks avoid marks on legs but still stay up. I found the Diabetic Cushion Socks very comfortable. I would recommend them to others. I have wide feet and ingrown big toenails plus I’m type 2 diabetic. 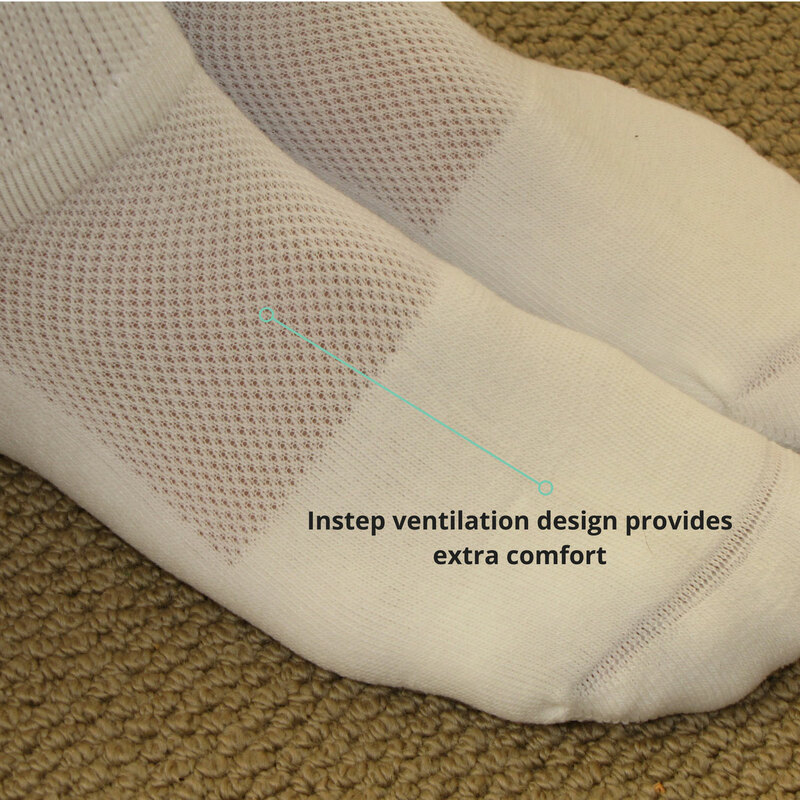 The Diabetic Cushion are wide fitting, they don’t draw the feet like other diabetic socks. I have shown and recommended them to my podiatrist, as I got two pairs I was able to give her the empty box and all details. There is no need to improve your service the service we received was wonderful and we appreciate your after sales enquiries on how we found the product. We will be back to purchase in the future. Great product. Good price. Excellent service. Great product. I am extremely satisfied, the socks have great cuffs and so do not leave an indent on my legs. I will recommend you. Keep up the good work and never go and close shop! I found other brands of sox are too tight for my swollen ankles. My TXG socks are much easier to put on. They are very comfortable and easy to wear and I’d recommend them. Customer Service and quality of socks is both very high. Mum has received the second lot of socks and they are perfect!! Thankyou so much for the help you gave over the phone great service!! People need to know how helpful you are!!! They are light airy, comfortable. They dont leave marks on my legs, even my husband loves them. 100% recommend them because we all have full time jobs where we are standing or walking 8+ hours a day, and I know they will love them just like we do. I have already told family and friends about them. Thankyou for the socks, my husband is very happy with them, I’ll be buying me some very soon. They are very comfortable and soft it feels like your not wearing any. Thank you for the prompt delivery of my order for socks. They are the most comfortable socks I have ever worn. Will definitely be ordering more in the future. Thank you, socks arrived earlier in the week, really pleased with them. I have bought the diabetic cushion socks from you a couple of months ago. My husband is not a diabetic but he loves the socks. Thank you for the surprise gift that came with my recent delivery of socks. A lovely idea and most useful. I also love my new TXG Diabetes Socks. They are super comfy. And the friendly, efficient customer service has made the online ordering experience a delight. Thank you. Thank you so much for your wonderful service. The sox arrived on Tuesday and they are just as you say, your messages are very much appreciated. I was looking for a sports style low cust sock which didn’t cut off circulation. I got the result I was after and enjoyed the added underfoot padding and so I have ordered another four pair. I would recommend these socks as they are a great product and high quality. Your customer service is amazing and very friendly and personalised. I would like to see other colour options in the short socks even adding a black would be great. Thanks so much – perfect and a very happy mother in law! Wow, what an awesome business. Thank you for the fantastic socks. I will definitely be buying again. I highly recommend this awesome business to everyone A++++ pity I can’t make my feedback ring like a bell in celebration !!!! Really love the last 2 pairs of socks I bought from your company. Walking around the block is a lot more comfortable and have the bigger block in my sights. Thanks Roy. I love the Diabetic Cushion Socks and will order 2 pairs. I will certainly be recommending these to anyone that I meet with a similar surgery. I wear my TXG compression socks everyday, they are most comfortable, not too tight on my legs and they don’t cut in. I love the quirky notes, I read every single one and I recommend TXG to lots of people. My diabetic cushion socks are excellent, I have been for a long walk wearing them and they are excellent, really comfortable to wear and they put no pressure on my legs. Awesome socks, great quality, really happy with the purchase, Mum loves them!